May 7, 2018, Portsmouth, Rhode Island: After close to a year of refining their Quality Management System with help from Rhode Island’s Polaris MEP, New England Boatworks Inc. (NEB) has been ISO 9001:2015 registered by NQA. 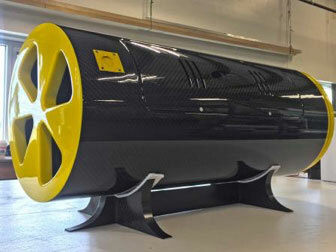 NEB joins a very limited number of Rhode Island Composites businesses who have attained this registration and, while NEB will continue its strong tradition of boat building and marine service work, we look forward to further diversifying our custom composite construction capabilities into new areas. NEB has long been known for their ability to bring custom projects from an owner’s dreams to reality building with aluminum as well as cutting edge composites. With continued advances in carbon fiber technology and its increasing popularity for use outside of the marine industry, NEB is excited to use our existing expertise in building with this strong, low weight material for new customers in new markets for NEB. “It was a pleasure working with New England Boatworks throughout their audit. There were good process controls including work instructions, software support and drawings in place showing that they are absolutely committed to meeting customer quality requirements. All staff interviewed had an exceptionally high knowledge of the policy, objectives and consequences of non-performance and were also found to be effective in meeting the organization’s defined objectives. It’s clear that NEB are dedicated to continually improve their Quality Management System and offer exceptional customer service”. Ron Kurtzman – NQA Associate Auditor. About New England Boatworks: New England Boatworks Inc. (NEB) is a full-service marina and custom builder with proven experience building sailing and power-yachts, architectural and artistic works, as well as components and assemblies for many industries. The team at New England Boatworks started building boats, including America’s Cup and Volvo Ocean Race participants, in 1988. Since then, they have grown and developed a skilled staff providing expertise in custom construction utilizing aluminum, composites, and other metals. About ISO 9001:2015 Quality Management Standard: ISO 9001:2015 is the internationally recognized standard for Quality Management Systems (QMS). It is the most widely used QMS standard in the world, with over 1.1 million certificates issued to organizations in 178 countries. ISO 9001:2015 provides a framework and set of principles that ensure a common-sense approach to the management of an organization to consistently satisfy customers and other stakeholders. In simple terms, it provides the basis for effective processes and effective people to deliver an effective product or service time after time. About Polaris: Polaris MEP is a (Rhode Island) statewide non-profit organization that provides competitive manufacturing business improvement programs to grow RI’s manufacturing industry. Polaris MEP is an affiliate of the National Institute of Standards and Technology’s Manufacturing Extension Partnership (NIST MEP) and a business unit of the University of Rhode Island Research Foundation. Since 1996 Polaris MEP has delivered improvement solutions to over 750 Rhode Island manufacturers to help them achieve sustainable and profitable growth.